The 2008 Pinotage vintage is looking good is the verdict from the annual tasting of tank samples from around the Cape, with flavours of plum, fynbos, coffee and mocha dominant. It rained often during the growing season with heavy rainfalls at the end of November and early December, putting more pressure on keeping the grapes clean from vineyard diseases. Although ripening was delayed for most cultivars and grapes were harvested two weeks later than usual, the early ripening of Pinotage was an advantage once again. Most of the Pinotage was picked ripe and in a healthy condition. “Anybody who has any doubt about Pinotage should have been here today. What stood out is the variation of type and style, there is something special to suit every palate,” said Dave Hughes, South Africa’s international wine judge. Duimpie Bayly, Cape Wine Master and convener of the Absa Top 10 Pinotage panel, was very impressed with the concentrated fruit flavours of most wines and the good potential for maturation. “The wide areas from where all these fine wines originate is a clear illustration that with the correct vineyard management and vinification, top quality Pinotage can be produced all over the Cape” , said Duimpie. “The wines we tasted showed competent blending and wood treatment to bring out the best. It is our experience at the annual Pinotage Vintage Tasting that the dedication from winemakers to produce top quality Pinotage wines increases year after year”. Thirteen 2008 tank samples were tasted, supplied by Delheim (Stellenbosch), Cilmor (Worcester), Beyerskloof (Bottelary), Riebeek Cellar (Riebeek-Wes), Bon Courage (Robertson), Lyngrove (Helderberg), Landskroon (Paarl), Spruitdrift (Olifantsrivier), Diemersdal (Durbanville), Clos Malverne (Devon Valley), Rico Suter (Breedekloof), Windmeul (Paarl) and Stanford Hills (Walker Bay). 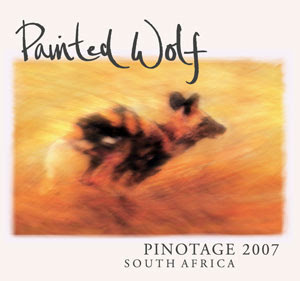 Pinotage is not only a popular wine in South Africa; 22½ Million bottles of Pinotage were exported in the year ended April 2008. 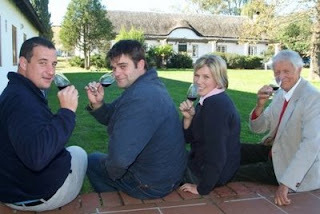 Pictured at the tasting are (from left) De Wet Viljoen (Chairman of the Pinotage Association’s organising committee), André Swanepoel (Cilmor), Alecia Hamman (Riebeek Cellar) and Rico Suter (Rico Suter Wines). 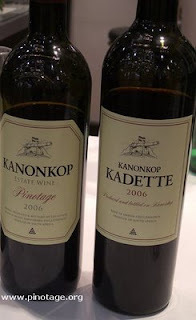 In the Pinotage Club June 1998 Newsletter we were reporting that Kanonkop were not releasing their 2006 vintage and that Magnotta in Ontario were an selling a Pinotage made from juice imported from the Cape blended with local non-vinifera wine. And who'd have thought then that ten years later at least four wineries in Canada are growing and making Pinotage? Entries for the annual Pinotage Top 10 Competition must be in by 9 July. The competition, organised by the Pinotage Association and sponsored by Absa Bank, is open to all Pinotage wines no matter where in the world they are produced. The competition is unusual in that ten equal winners are chosen. This is to recognise that there are many different ways to interpret the Pinotage variety and to give a chance to them all. Every competition so far at least one first time entrant has been a winner. 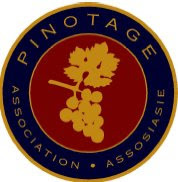 Rules and entry forms may be found at the Pinotage Association website here. 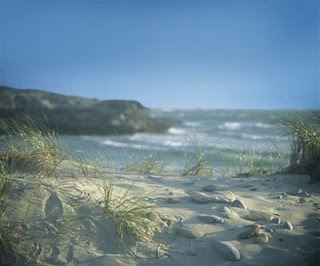 If you fancy sitting on Arniston Bay (pictured left*) and you live in the UK then don't delay. The Arniston Bay wine company, pioneers of Pinotage Rose in a pouch (see here) are running a simple competition in conjunction with the Metro newspaper with a prize of a trip to South Africa staying in Arniston Bay and Stellenbosch. The competition is free to enter and is running all this week, click here. "The best fizz around at the moment is the surprise bottle; a delightful pink South African based on the red Pinotage grape. Looks commercial but tastes fab. A juicy strawberryish fizz with a proper dry finish," says Susy Atkins, writing in the Sunday Telegraph 22 June 08, about FirstCape Sparkling Rosé NV. There's no more information about this wine on FirstCape's infuriatingly tedious and over-flashed website, except that the wine retails at £7.99 from Sainsburys. 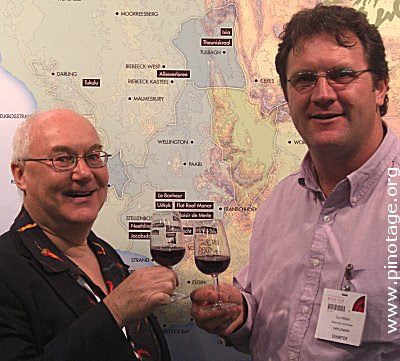 Kanonkop owner Johann Krige (pictured right) was pouring the newly released 2006 vintages of Pinotage and Kadette Cape Blend at last months London International Wine Fair. 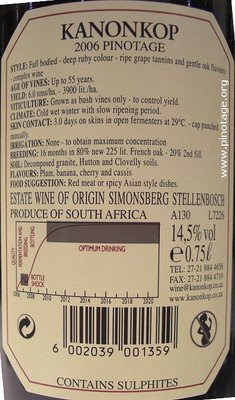 Kanonkop have the most detailed labels in the Cape – although USA labelling requirements unfortunately means consumers there don’t get the useful maturation chart on the back label, so as a service to them I am showing the labels below. Just bottled, but I’m thinking this is showing all the signs of being another cracker. It is elegant, showing restrained berry fruits, balanced by tannins and fruit acids. A classic Cape Blend of three Bordeaux varieties - Cabernet Sauvignon (32%) & Franc (9%), and Merlot (20%) - married to 39% Pinotage. It is immediately attractive, with ripe fruits, sweet blueberry and raspberry flavours, really enjoyable easy drinking. Johann says “it has sweet accessibility from Pinotage that you can’t get from Cabernet Sauvignon, but without getting too fruity". 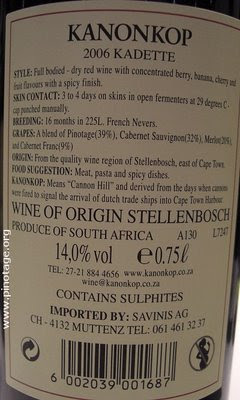 Back label from Kanonkop 2006 Pinotage. Note the 'Estate Wine of Origin' appellation, showing all the grapes were grown on the estate, the wine made matured and bottled on the Estate. Back label from Kanonkop 2006 Kadette Cape Blend. Note the 'Wine of Origin' appellation, showing that is is not an Estate wine. Some of the grapes would have come from vineyards outside the Estate boundaries. "I get a great thrill from being able to nip into the cellar and come out with a bottle that is probably the only one in Britain, maybe the world. How many 30 year-old New Zealand Pinotages have you got?" Grayhaven Winery is one of three wineries in the state of Virginia, USA growing and making Pinotage. 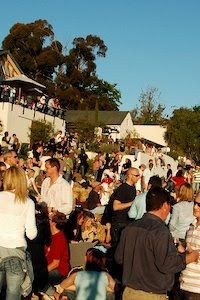 On a warm and sunny spring day I left the hustle and bustle of the fast-paced city to visit Grayhaven Winery. 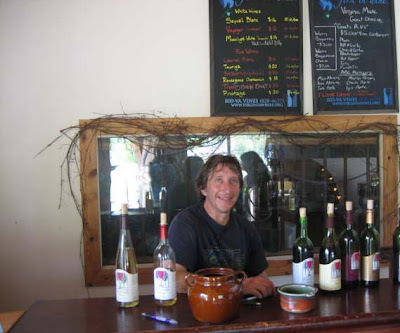 Grayhaven is a part of the Heart of Virginia Wine Trail and is located on a relaxing and rural 50 acre farm in the small town of Gum Springs, VA. Grayhaven is a small family-run operation that is owned by Charles and Lyn Peple, who began growing and selling wine grapes in 1979. Sixteen years later they built a tasting room and started making and selling their estate bottled wines to the general public. Today, daily operations are assumed by daughter, Max Peple, and husband, Deon Abrams. After turning into the winery on a single lane gravel road, I was warmly greeted by the tail-wagging winery dog Mona. Mona led me into the tasting room where Deon invited me to the tasting bar to sample their wines. While chatting with Deon and tasting Grayhaven’s full array of wines, I learned that Deon was Grayhaven’s chief winemaker and is from South Africa, where he made wine before settling here in the Old Dominion. Although Deon is the chief winemaker, he explained to me that winemaking at Grayhaven is a true family affair, stating that, “a lot of our winemaking takes place at the dinner table where we'll try the new vintages and make group decisions as to how to proceed.” As my eyes perused the rustic, yet charm-filled tasting room, Deon’s South African influence is noted in the gift shop where a number of unique artisan crafts and food selections are imported from South Africa. The true tell-tale is Grayhaven’s flagship wine; no, not Cabernet Franc, Norton or Viognier, but Pinotage - a grape variety developed in 1925 at Stellenbosch University in South Africa from crossing Pinot Noir with Cinsaut..
Grayhaven Winery specializes in small lots of hand-crafted wines made from vinifera, French-American hybrids, and other unique grape varieties. Varietal wines offered - such as Seyval Blanc, a rare Rkatsiteli, Touriga, Cabernet Franc, and Chambourcin are leaner wines with subtle flavoring and good balance. These easy drinking wines make for nice sippers or accompaniments to a number of food dishes since the flavors are not over- powering, but complimentary. The exception to these leaner bodied wines would be the Pinotage, which is the winery’s most popular wine. Deon tells me that their Pinotage ripens beautifully with high brix levels and the results are much different than what one would expect from typical South African examples. Grayhaven's Pinotage is bigger and more fruit forward, lacking the smokiness and earthiness found in some South African examples. Although there is no distinct Virginia Pinotage style, it is interesting to see what this grape variety can do in Virginia soil. With wine, cheese, and warm French baguette in hand, I left the tasting room and found comfort sitting by a nearby pond. I enjoyed my visit to visit Grayhaven Winery on this beautiful spring day and look forward to many happy returns. If you are ever in the area, I recommend visiting the winery and experiencing “a hip slice of country life” for yourself. Dezel Quillen is Founder, Photographer & Wine Writer – Virginia Vine Spot, and Wine Column Contributor to VA Wine Lover Newsletter. "I’m not trying to make Pinotage better, just trying to give it a spin,” says Guy Webber, uncorking an unlabelled bottle. Guy Webber’s Pinotage/Chenin experiment is very soft and fruity with a distinct floral edge. It tastes quite sweet, very soft and maybe a little hot on the finish. “I think the Chenin brings out a certain herbaceousness,” says Guy. “The fruit comes from vineyards on Uitkyk farm that we use for our Hill & Dale label. The Pinotage and Chenin grown there both ripen at the same time.” With a top-up I’m finding the wine opening and its ripe floral softness becoming even more attractive. It is just an experiment, the wine is in tank, and Guy isn’t intending bottling it for commercial release. “Think again,” I suggest, “how about a limited edition ‘winemakers experimental programme’ bottling like some California wineries do?” "Hmmmm...." replies Guy. Guy Webber, winemaker at Stellenzicht (right) with Peter F May. No, he's not standing on a box. I didn't know before but Cyprus is a rare country, like Chile, free of the scourge of Phylloxera and therefore able to grow vines on their own roots. And having not suffered the devastion of their vineyards Cyprus is lucky in having an abundance of rare indigenous varieties such as Xynisteri, Mavro and Maratheftiko. But how to sell such varieties to an international market? Wines from Cyprus suggest that "there is the potential to promote a Cyprus Blend similar to South Africa's Cape Blend. The latter country has made a name for its unique mix of native Pinotage and Bordeaux grapes." Leading South African wine writer Neil Pendock has become a wine maker. He writes in his Johannesburg Sunday Times blog "Having bought Lemoenfontein, a modest wine farm on the Paardeberg, last year, I decided to make the most traditional wine I could from ancient bush vine Pinotage grapes growing on the farm’s steep slopes. The wine was fermented using wild yeasts and matured in third-fill French oak barrels." Neil is exhibiting a barrel of this wine at a 6th Sense art show during annual conference of PRISA (the PR Institute of Southern Africa), which this year has as theme Communication – the Sixth Sense. "We’ve decided to call it 'the six P’s'", he says of his wine. " The first five, arranged alphabetically are Paardeberg, Pendock (the artist), Perold (the pioneer who produced Pinotage by crossing Cinsault with Pinot Noir), Pinotage and PRISA. The final P is a pee, the ultimate end-state of the work once it has passed through the body." Painted Wolf Wines is a brand new venture from Jeremy and Emma Borg. I first met Jeremy many years ago when he was with Fairview Winery for whom created the fantastically successful Goats do Roam brand. Since then Jeremy has been involved in several campaigns but now he is putting his considerable marketing expertise behind wines he himself is making. Painted Wolf takes its name and inspiration from the ‘African Painted Wolf’, or Hunting Dog. “With their unique “painted” coats they are remarkably beautiful animals and Africa’s most successful hunters due to their extraordinary team work, focus, energy and persistence, and the care and nurturing they provide each other - individuals working in harmony for the success of all,” says Jeremy, who intends that the brand will aid conservation of these endangered predators. 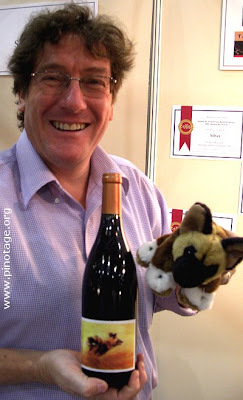 It was good to renew acquaintances with the ever cheerful Jeremy at the London International Wine Fair and taste the first two Painted Wolf wines - Pinotage and a Cape Blend .